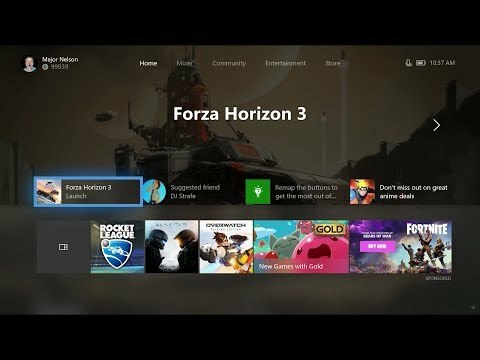 Major Nelson, along with Xbox Platform Engineer Mike Ybarra, have showcase the newest Xbox One Dashboard coming to Xbox One very soon. Let's have a breakdown if you don't want to watch the video - why you wouldn't I don't know but hey! Right off the bat the changes are obvious, the Dashboard and the Guide menu have been completely revamped. The dashboard now contains four prominent areas, the first lets you jump straight into the last game you were playing/the game you are currently playing. The second is suggestions such as games or friends you might find interesting. The last two are hints/tips or suggested marketplace deals/content you may find useful. There is another strip underneath which features a quick link to your games and apps, along with some more marketplace content. Further down you will notice a new concept called 'Content Blocks'. These are fully customisable blocks of content which are chosen and arranged by you... you can choose from game specfic content blocks, blocks pertaining to your friends and their activity, your pins, your Game Pass games. Moving onto the Guide Menu has also had a revamp, and isn't too dissimilar to the days of the 360 blades concept in that you have your horizontal headers at the top and you can move sideways amongst them all using the thumbstick or the bumpers. The community tab has also had a layout overhaul using more of a liquid layout for mass consumption of content that loads a lot faster than previous builds. You can now filter the activity feed to show only content you want to see.